Tom Cruise has, undeniably, had an impressive career in movies. But at 50, Cruise and his roles have matured a bit along the way and gotten even more interesting. The brashness of early films like Risky Business and Top Gun led to more thoughtful roles like The Last Samurai and Valkyrie, and four installments of Mission Impossible over a decade and a half certainly gave him opportunity to really get under the skin of a character. 2010's Knight and Day was a tremendously fun, if not manic, action flick that gave him the chance to be truly funny while still keeping the audience on the edge of their seats (in part because of the suspenseful plot, and in part because we were never really sure if Cruise's character was nuts or not). In Jack Reacher, we see Cruise's cockiness evolve into confidence and self-assuredness. Reacher is a mysterious, former U.S. Army MP who has been completely off the grid for a few years, but he resurfaces after seeing a story on the news about a gunman in Pittsburgh who shot and killed five random strangers in a park near the Allegheny River. A former army sniper, James Barr, is arrested after police find significant evidence placing him, his gun, his bullets, and his van at the scene of the crime. All Barr says in his defense is, "Get Jack Reacher." Before the district attorney, Alex Rodin (Richard Jenkins), and the lead homicide detective (David Oyelowo) can even figure out who or where this Jack Reacher is, Reacher walks into the DA's office. Reacher insists that he is not Barr's friend, and then walks out when they refuse to show him the evidence they have in the case. Just then, Barr's attorney, Helen Rodin (Rosamund Pike) arrives and is upset that they have contacted Reacher without notifying her. Her issues with the DA go a little deeper, however, when we learn that he is also her father, and the conflict between them is more than strictly professional. Helen convinces Jack to become her lead investigator on the case, despite Jack's insistence that he has come to Pittsburgh to bury Barr. There is far more going on here that meets the eye, and Jack Reacher is more than up to the task. The movie tagline suggests, "The law has limits. He does not." But don't be fooled into thinking this might be just another mindless, tough-guy-vigilante-beating-the-crap-out-ofbad-guys-and-blowing-up-buildings-kind-of-movie. Sure, there are some baddies who deservedly get their butts handed to them, and there is a fair amount of gunfire along the way. But Jack Reacher is a thinker, a very smart, very tough guy who not only knows how to handle himself, but also understands how his opponents will act, and react, in any given situation. Two of my favorite performances came from some people I didn't even know were in the movie. The first was from Werner Herzog playing a pretty creepy character known only as "The Zec." Herzog is a very prolific writer-director-producer over the past 40 or 50 years whose body of work includes a rather large number of documentaries peppered eclectically with dramatic works and whatever else strikes his fancy. The second surprise was one of my all-time favorite actors, Robert Duvall, who took the somewhat small role of Cash, a gun range owner, and turned it into one of the most enjoyable characters in the film. Duvall's ability to take a character and flesh it out with intricately, compelling layers of depth and humanity is manifest with an easiness that only comes from decades of living and absorbing life's experiences. The movie also features one of the most anti-climactic-yet-deeply-satisfying car chase endings ever captured on film. 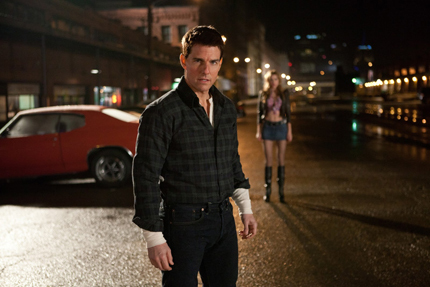 Jack Reacher is based on a book by Lee Child, and the screenplay was written by the director, Christopher McQuarrie, a long-time friend and collaborator with Tom Cruise. This is not a family film, but it is a very watchable, very enjoyable action-suspense story with a fair amount of humor in just the right places. And because Child has written other Jack Reacher books, I suspect this won't be the last time we see Jack Reacher. Or, for that matter, Tom Cruise. At 50 years of age, Cruise is doing a lot more than just hitting bad guys; he's also hitting his stride as an actor, and I, for one, am glad to be along for the ride.